Shintoism is a major religion in Japan and beyond various references to the spiritual nature and the understanding of a few terms, I know precious little about it. As such it’s very hard to understand a lot of the driving forces behind this anime, Red Data Girl. As the opening titles like to point out, there was a book called the Red Data Guide which was a great resource for endangered and rare birds. The series infers that day by day the old ways are indeed rare and along with it the traditions shown in this series. I’m all for preservation of ways of life and historical anthropology as much as possible. But this isn’t really the goal of this anime, and after watching it I have precious little to say what it’s really about. On the surface it seems like a primer and interesting take on the mysticism surrounding the Shinto religion, but it’s not much more to me than an excuse for a high school girl to feel alone, afraid and outcast. Izumiko Suzuhara is a 15 year old girl practicing the arts of the Tamakura Shrine. She has a strange curse of sorts where advanced electronics just break if she uses them, beyond that her personality is one of shy bewilderment whenever she interacts with either part of her being. As a spiritual medium she seems woefully unprepared. Granted not in the “Clumsy Cute Anime Girl” way, but generally being the holder of a great destiny but being told absolutely nothing about it until every other character does all the research and explanations for her. We drift through this anime learning very little, and when conflicts flare up we are confused on what, exactly, is at stake. This is a world filled with a mysticism we know little about, and are pretty much expected to fill in the gaps of Izumiko’s poor education. The real meat behind this series is the interpersonal relationships between the practitioners of these mystic arts. Izumiko finds many benevolent spiritualists and spirits who are both for her and against her. All of these characters are basically on one side or another of her destiny to be a vessel of a greater spirit or Kami. Izumiko would normally be the heroine of this story, but as it stands she’s usually just a bystander at best and McGuffin at worst. She even has a very strained relationship with her protector, a boy raised as a wondering monk or “Yamabushi” named Miyuki. He is brash and ready for great things, but sees little in being nothing more than Izumiko’s protector. Their relationship is mostly one of maiden and rebellious knight errant who wants nothing to do with her, but as one of her only links between her desire to be a normal person and her ties to the spiritual realm she’s pretty much forced into a one sided infatuation to earn his acceptance at the least, his heart at the most. Admittedly she learns and grows as the series goes on, but there is precious little to relate with. It’s a glaring flaw in an anime that does little to grab one’s attention. I would have liked to see the spiritualism mean something other than the ever present ominous tone that lies sprinkled around. At the very least capitalize on some of the powers to make things interesting. For instance: early on Izumiko tries to use a computer, wherein she doesn’t really use the computer but her spiritual powers kick in and she finds herself spiritually using a computer program to communicate with her father in Tokyo. It would be as if you mentally willed Skype to open up on a friend or loved one with only your mind. They never capitalized on this, and Izumiko is more frightened than curious about things like this so it’s never expanded upon or dealt with ever again. For a series filled with Japanese tradition one would think that there might be an interest in learning the rules on the realities of spiritualism in the world of Red Data Girl. But we don’t, leaving things very cryptic until Izumiko’s protectors show up with an answer or things just end wrapped in a neat package. Technically this series is animated well, voice acted well and the art style lends itself to being a kind of normalcy floating on a river of ancient practices and spiritualism. 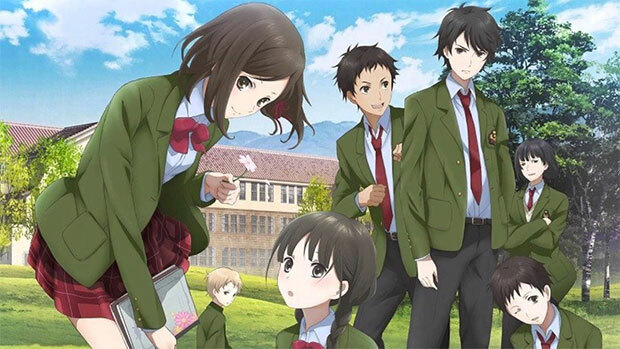 But for all of its bluster about holding and keeping spirits from destroying the world, there is precious little in this series beyond a boy and a girl learning to work together and fall into a relationship. This anime is based on a series of books which have to be a better read than the anime makes it out to be. I’m not sure if this series was trying to convey the same kind of confusion living as a keeper of ancient rituals and knowledge in the modern world could be, but it seems like the kind of inner turmoil better explained through the written word than the medium of television. Mushi-Shi did its best to be beautiful, thoughtful and above all interesting. But Red Data Girltends to pull its punches, giving you precious little than the mundane to keep you entertained. And if you’re looking for a simple story about relationships there are far better series to scratch that itch. In English or Japanese, the voice actors do a fine job keeping the characters realistic and pleasing. The effects when mysticism is brought into play is kind of otherworldly and fitting the gravity of the situation. Some of the ideas in the series are solid, even if they may be ignored or not expanded upon. Conflict is scarce in relation to the importance placed on events in the series. The heroine has precious little to do or any expertise to make her a dynamic or important part of the cast. For a series billed as a journey into the spiritual world, it gets pretty boring and plain.